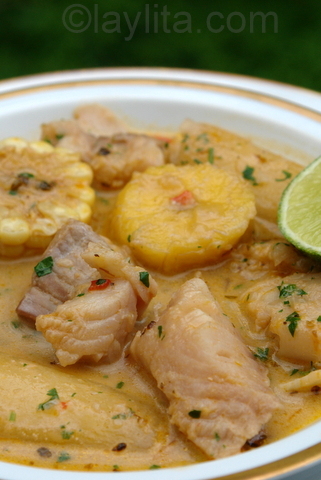 This soup is called biche de pescado, also known viche de pescado, and is a typical soup of the province of Manabí, but is served all over the coastal region of Ecuador. 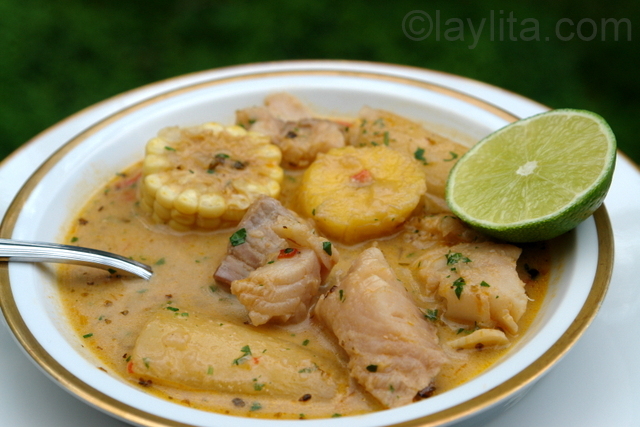 It has been quite some time since I’ve had this delicious fish soup, it’s very thick, almost a stew, and the contrast of flavors is amazing: fish, yuca or cassava, sweet plantains, sweet corn, peanut, onions, garlic, spices, and cilantro. Preparing this soup brought back so many memories, especially when I got to the point where I could start smelling the final result it (and even more as I tasted it). It’s one of those soups that is so good and comforting. If you’ve ever had it before you’ll remember the taste just by thinking of it or looking at a picture of it. If you never had it before, try it, you will not be disappointed, it will become one of your favorites. 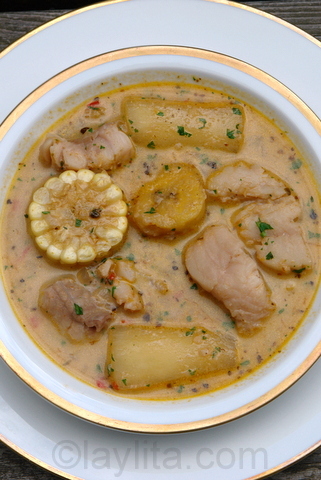 Biche de pescado, or viche de pescado, is a traditional coastal Ecuadorian soup made with fish, peanuts, yuca, sweet plantains, corn, and other vegetables and spices. Bring 8 cups of lightly salted water to boil, add the fish heads, bones and other pieces, boil for about 30 minutes or until the pieces begin to come apart, strain the broth. Heat the 2 tbs of oil over medium heat to prepare a quick refrito, add the onions, garlic, cumin and salt, cook until the onions are soft, about 5 minutes. Blend the lightly toasted peanuts with the refrito, the milk, and 2 cups of the fish broth, blend until smooth. Strain the peanut, milk, refrito and broth mixture and mix with the remaining fish broth plus 2-4 cups of cold water. Heat the 2 tbs of oil over medium heat; add the chopped onions, garlic, pepper, achiote powder, cumin, oregano, salt, and cook over low heat until the onions are translucent, about 10 minutes. Add the fish peanut broth and bring to a gentle boil. Add the corn, the yuca and the 2 tbs of peanut butter. Simmer for about 35-40 minutes or until the yuca is cooked. 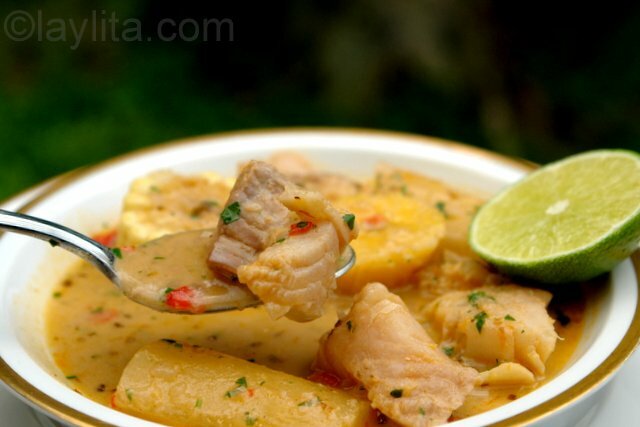 Add the plantain slices and the fish chunks, cook on low heat until the fish is cooked, about 8-10 minutes. Sprinkle with the chopped cilantro and serve warm with lime slices. There is something about soups in Ecuador, we take them very seriously, probably because we eat them almost every day, when I go to a restaurant in Ecuador it isn’t a questions of whether to have soup but which soup to have, but anywhere else (US, Europe) that I’ve been unless there’s a strong recommendation for the soup I usually don’t order soup, even at home I need to eat soup at least once a week. Additional vegetables, such as squash, sweet potatoes, green beans, and other types of beans, are sometimes added to this fish soup. For a summer soup I prefer it a little bit lighter and am not adding more than the essential sweet plantains, yuca, and corn. Biche de pescado can also be made with shrimp (biche de camaron) instead of fish or a mixed version that includes shrimp and fish, they’re all very good. The soup is prepared using a quick homemade seafood broth, which is usually made with fish heads, unfortunately I arrived at the fish market at little bit early –and apparently the best time to find fish heads is after 3pm – so instead of making the broth with fish heads and bones, I bought a small ¾ lb trout, cut in a few pieces and used it to make the broth. You can also substitute with store bought seafood stock or just use plain water instead. Most of my dishes always have a few side dishes, but this is one of this really simple ones, lime or lemon slices are a must have, and hot sauce is optional, I like it with hot sauce, but my husband thought the soup was so good and the flavor was perfect that it didn’t need hot sauce, I took this a compliment since it came from a guy who doesn’t really like peanuts that much and is a huge hot sauce consumer. I came across this and it looks amazing! I’m going to make it for some guests next week. My question is this: can you use peanut butter in place of the 1 cup lightly toasted peanuts? Yes, you can use peanut butter instead of the toasted peanuts. But the ratio would be less, so between 1/3 cup to 1/2 cup depending on how much peanut flavor you want in the soup (and the taste of the peanut butter you are using) – and make sure the peanut butter is unsweetened. This was absolutely delicious. My toddler ate five servings and my husband said it was the best soup I’d ever made! Do you know how I could get corn like the corn in Ecuador? It is not sweet, and is super starchy, but I love it a lot. :-)!!!! My in-laws retired to Cuenca and when we visited them, we traveled to Macas and went to the jungle. Loved all the food everywhere we stopped, esp the soup!!!! I have tried a lot of kinds of food and there is just something about Ecuadorian food, it is complex and simple at the same time. What a great website you have, I can’t wait c to make some of the recipes!!! If not all of them! Hi Amy – Sometimes I can find choclo style corn at the Latin grocery stores. It’s usually frozen, either in kernels or on the cob. The fish soup looks absolutely delicious!! i suspect that a few more people will visit for more information about viche/biche. you do an amazing job with all of your recipes, and i look forward to every post! Hi Lisa – Thanks for information! Love the photos! I cooked this recipe and I loved it. The procedure was very easy to follow. Thank you so much for the pictures. Thank you Laylita , I made this recipe last week and it was a delight. My husband was so impressed, that I have been learning to make his favorite Ecuadorian meals. Tonight I will try another one your your dishes. from korean parents, i born in ecuador stumblem upon this website trying to find anything ecuadorian. oh how happy i was! came to the states when i was 10yo so i only remember flavors but not the actual cooking. i’m making this soup right now… and OMG, it’s delicious and just the way i remember it. thank you!!! I just returned from a month long visit to Ecaudor. I was so fortunate to have been placed in the hands of a local Ecuadorean cook who served me this biche at the home of a friend in Casa Blanca. It was my first meal there, and it was fantastic. Having lived in Mexico and Venezuela, I was absolutely stunned at the rich variety of Ecuadorean dishes that I think of as “comfort food” because they convey a wonderful sense of contentment after eating them. Thank you from the bottom of my heart for your site. The patacones, aji, and others brought them to life again. I visited Ecuador for the first time for two weeks for our church mission trip and I just love the foods! I love the Biche de Pescado a lot. I found your website and I am excited to find the recipe here. Your photos really make it so easy to follow. I am planning on making the dish for my party this weekend and I can’t wait! Thanks so much. Quedo riquisimo con salmon, la combinacion con el Mani fue perfecta. En Alaska comemos salmon muy seguido y el cambio fue muy bueno. Yo le agregue dos cucharadas de harina de platano (que me trajectory de Ecuador ) y le dio la espesura perfecta! Hoy pesque 3 silver salmon! asi que lo voy a intentar y te cuento como quedo. Solo espero (pequeno milagro) que tengan maduros en el Safeway! soy de la costa de Ecuador pero ahora vivo en Alaska. Tu crees que el biche salga bueno con Salmon? Es lo unico que encuentro aqui! Salmon y Halibut. Hola Priscilla – Preparalo con Halibut (el halibut es sea bass, igual que la corvina). Aunque tambien creo que quedara rico con salmon aunque no lo he intentado. Let’s ignore the soup. Let’s ignore the memories. What a novel way to present the basics and fine details to a recipe. So; before I even finish preparing this wonderful dish I say thank you. If I mess it up it is certainly; only, my fault. Wow!! I’m so excited to make this soup, all of your other receipes remind me of my visits to Ecuador and my family’s cooking. I hope I can use these to remind my family of our great memories, thank you so much! Now I can make it myself and not have to drag everyone to the Ecuadorian Resturants!! Ummm que rico, se puede substituir la leche de vaca por leche de coco o soya tambien!!! You can also substitute cow’s milk for coconut milk or even soy milk!!! This is an amazing soup. I am from central america… but have a lot of ecuadorian friends. I learned how to make it and can never get sick of it . Give it a try ! Thank you so much for these recipes! I only jotted down the recipe for this biche when I left Ecuador and who knows where that is…? Thanks! Awesome soup! Its perfect as is, but I’m now itching to take a Thai spin on this… some fresh green curry paste for the dry spices and coconut milk for the cows milk. I’ll have to give it some thought… I don’t want to take out too much I kinda want a East/West blend. qué rico por Dios! Sabes que entré a tu block buscando inspiración para maniana, y la encontré jeje tengo que hacer esta sopa Layli, me encanta! Unbelievably beautiful and extremely delicious sounding. I am saving this one! You have been nominated for an award… Please visit my blog for more info! Jenni – my kids loved this soup, they love sweet plantains so that was an incentive for them, I also let them help with the preparation (stirring the soup, peeling garlic, peeling the plantains) and it seems that whenever they get to “help cook” they are more likely to eat it. Rosa – Gracias, tu blog es super chevere, se me hace agua la boca cuando veo todas las delicias que preparas. Rosa – Thanks, definitely try this soup (we finished it yesterday and I’m already thinking about making it again). Emily – That’s funny, I have a salmon recipe that I’m going to post in the next few days, so I’ll send it. This sounds (and looks) amazing! I love the addition of plantains. Do you have any great salmon recipes? We’re having a salmon recipe contest and awarding the winner with 15 Pounds of Wild Salmon … the only downside is that the prize can only be sent w/in the U.S. But we’d love to have you share a recipe regardless! Check out the contest at http://marxfoods.com. And if you have salmon-loving family and friends, please pass this on – the deadline is this Friday, June 20. Me encantan tus recetas, tus fotos… Maravilloso!!!!!!!!!! Hi Erin – Lucky you living in Costa Rica! The milk is actually not an essential ingredient, I’ve had it just with the broth or water and it’s just as good. I can’t tell you how excited I am to make this soup! I live in Costa Rica, so all of the ingredients are readily available and inexpensive, and my partner is lactose-intolerant… with a bit of lactose-free milk, this looks like an amazing meal for the two of us. Absolutely delicious, thank you so much!